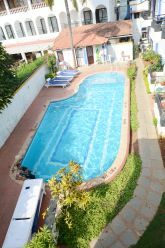 This 2 Star hotel is located near Baga Beach in North Goa. Bearing a total of 24 rooms, Ronil Royale also has a multicuisine restaurant, Case De Jantar. The hotel boasts a bar parlour that serves alcoholic and non-alcoholic drinks. To relax, one can take a dip in the sparkling waters of the swimming pool, which also has a kids' section. The hotel's proximity to the golden beaches of Baga, shopping complexes, bars and restaurants makes it a convenient place to stay.